System Activation Key Has Expired is the PUP that uses misleading techniques to prevent removal. Use Reimage to locate malicious components and get rid of them faster than with uninstall instructions. A full system scan blocks virus reappearance and prevents traffic to malicious domains. 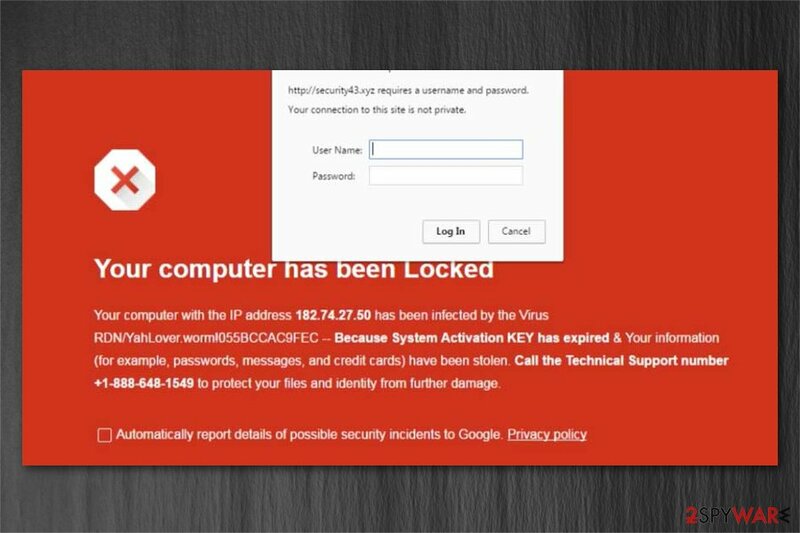 System Activation Key Has Expired is a scam pop-up which might trick you into believing that your computer is infected and you need to contact the so-called technical support. System Activation Key Has Expired is a pop-up which may occur during user's browsing sessions. It is displayed by an unreliable website and claims that sensitive data has been stolen due to expired activation key. Despite how legitimate it may look and sound, you should immediately close the window or tab once you receive this message or you might be lured into giving personal information for the criminals. People encounter System Activation Key Has Expired message if their computers are infected with a potentially unwanted program (PUP) called adware. This application is designed to deliver scam notifications to lure people into believing that their systems are infected with malware, and personal data is at risk. Once “System Activation Key Has Expired” appears, people are encouraged to call the technical support number 1 877 670 2749. However, this message is fake, and users should never contact the supposed “help.” This is because the indicated number would only connect you with the scammers. If you fall for System Activation Key Has Expired alert and call via given number, cybercriminals might demand you to let them access your computer remotely or purchase highly expensive so-called security software to protect your data. Unfortunately, they aim to infiltrate your system with more malicious programs to force you to continue paying for their fake services. System Activation Key Has Expired is a scam which is delivered by an adware program that is installed on your PC. Therefore, never believe such fraudulent messages and remove System Activation Key Has Expired virus as quickly as possible. The best decision would be to install a professional and reliable antivirus which would eliminate all potentially unwanted programs that might deliver scam alerts for you. We highly recommend using Reimage for System Activation Key Has Expired removal. Although, you can uninstall the adware from your computer manually as well. For that, please check the elimination instructions presented at the end of this article or get help from a specialist. One of the most successful distribution technique which is highly used by cybercriminals to spread potentially unwanted programs is called bundling. Similar to other PUPs, adware enters the system in the same way — inattentive people install it during the installation of free applications. This happens when users rush to finish the procedure and pick Quick or Recommended parameters of the installer. This way, the adware is hidden among the optional components and can enter the system without direct user's permission. For this reason, we always advise people to install software only with Advanced or Custom settings. It is essential to understand that System Activation Key Has Expired virus can harm your computer if you keep it on your system for long periods of time. Thus, NoVirus.uk team points out that every user should get rid of it as soon as the fraudulent message pops up during the browsing sessions to protect their computers. First, you can remove System Activation Key Has Expired by merely closing the window or tab. Although, this is just a short-term solution as the scam message will continue to pop up in the future. Likewise, there are additional measures that should be taken for a permanent elimination. System Activation Key Has Expired removal can be completed in two ways — automatically and manually. If you want to ensure safe browsing in the future, get a reliable antivirus and run a full system scan. Otherwise, try to uninstall the adware manually with the help of the guidelines below. If you want to stop seeing “System Activation Key Has Expired” pop-up, search and uninstall all suspicious programs from Windows as shown below. Here, look for System Activation Key Has Expired or any other recently installed suspicious programs. Wait until you see Applications folder and look for System Activation Key Has Expired or any other suspicious programs on it. Now right click on every of such entries and select Move to Trash. During “System Activation Key Has Expired” virus removal you should reset IE settings which had been compromised. When in the new window, check Delete personal settings and select Reset again to complete System Activation Key Has Expired removal. Once these steps are finished, System Activation Key Has Expired should be removed from your Microsoft Edge browser. Unwanted ads rely on add-ons, plug-ins, and extensions. Thus, you can get rid of the adware by deleting untrustworthy entries from Mozilla. Here, select System Activation Key Has Expired and other questionable plugins. Click Remove to delete these entries. Now you will see Reset Firefox to its default state message with Reset Firefox button. Click this button for several times and complete System Activation Key Has Expired removal. Here, select System Activation Key Has Expired and other malicious plugins and select trash icon to delete these entries. Click Reset to confirm this action and complete System Activation Key Has Expired removal. Here, select Extensions and look for System Activation Key Has Expired or other suspicious entries. Click on the Uninstall button to get rid each of them. Now you will see a detailed dialog window filled with reset options. All of those options are usually checked, but you can specify which of them you want to reset. Click the Reset button to complete System Activation Key Has Expired removal process. 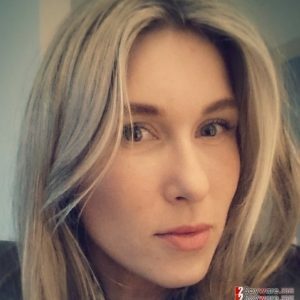 ^ Tech Support Scams. Consumer.ftc.gov. Federal Trade Commission. This entry was posted on 2018-06-14 at 03:08 and is filed under Malware, Viruses. You can quickly scan the QR code with your mobile device and have System Activation Key Has Expired manual removal instructions right in your pocket. How did you remove System Activation Key Has Expired?